In this video we will discuss implementing required validation on a select list in ASP.NET Core. Let's understand this with an example. We want to make the "Department" field required. Among the options, we want Please Select as the first option. Please Select is not a valid selection, it is just an option to prompt the user to select a valid department. The Department select list is bound to the following Dept enum. We want the first option in the Select List to be Please Select. The easiest way to achieve this is by including an <option> element in the select list HTML as shown below. value attribute of the Please Select option element is set to an empty string. We are also using asp-validation-for tag helper to display the validation error. To apply red font-clolor to the validation error, we are using text-danger Bootstrap class. The Select List is bound to Department property of the Employee model class. 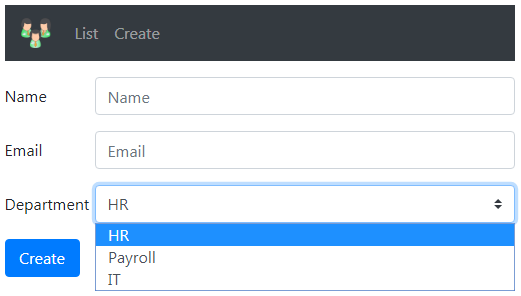 To make the Department Select List required, apply [Required] attribute on the Department property of the Employee class. 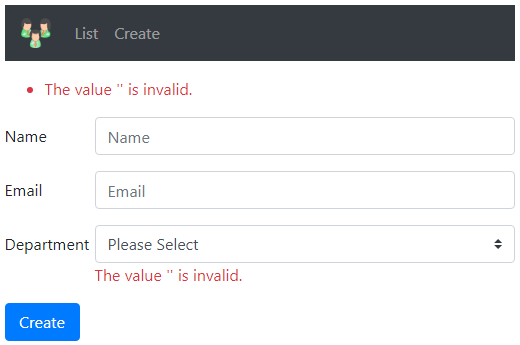 At this point if we run the project and submit the form without selecting a valid department from the select list we get the error - The value '' is invalid. The error that we are getting here is not the required validation error. To prove this, remove the [Required] attribute from the Department property of the Employee class and you will still get the same error. Let's first understand why we are getting this error - The value '' is invalid. The datatype of the Department property is Dept enum. By default an enum underlying data type is int. An empty string is set as the value for Please Select option of the select list in the HTML. So when this option Please Select is selected from the select list, the value empty string is used as the value for Department property whose underlying data type is int. Obviously an empty string is not a valid value for int. This is the reason we get - The value '' is invalid. Value types (such as int, float, decimal, DateTime) are inherently required and don't need the Required attribute. However, if you make the Department property, a nullable property by including a question mark then the [Required] attribute is needed to make the field a required field. If we now submit the form with Please Select option selected we get Required validation error as expected.